Eating more meat, bacon and cheese and less bread, fruit and sweets may help you lose weight, but it may not help lower low-density lipoprotein, or "bad" cholesterol, according to a 2016 review study published in the British Journal of Nutrition. In fact, it may have the opposite effect. Making a few modifications to your protein choices and eating more healthy plant foods and fats might do the trick, however. If your cholesterol levels are going up, consult your doctor to discuss diet and treatment options. Eating 150 grams of carbs or less a day is considered a low-carb diet. However, many popular plans restrict carbs to as few as 20 grams a day. If your LDL cholesterol level concerns you, you might want to be a little more liberal with your carb restriction, according to the Harvard School of Public Health. A 2005 study published in JAMA investigated the effects of different levels of protein, carbs and fat on LDL cholesterol levels in a group of people with high blood pressure. The study found that a higher protein diet with a moderate amount of carbs helped lower LDL levels better than a higher carb, low-fat diet. That doesn't mean you should eat more pasta and white bread. Those extra carbs should come from vegetables, low-carb fruits and plant proteins such as beans, lentils and peas. A number of healthy veggies have 10 grams or less per serving, including spinach, broccoli, kale, peppers, tomatoes, asparagus and cauliflower. Pumpkin, technically a fruit, is also very low in carbs with 5 grams in a 1/2-cup serving. Using net carbs -- total carbs minus fiber -- some fruits that might fit your plan include raspberries with 7 grams per cup and strawberries with 8 grams per cup. Legumes are little higher in carbs; a 1/2-cup serving of cooked lentils, kidney beans or garbanzo beans has 12 to 16 grams of carbs. High saturated fat intake on a low-carb diet may explain why LDL cholesterol levels increase. These fats are found in high-fat beef and pork products such as bacon, sausage and porterhouse steak; full-fat cheese; and skin-on chicken and turkey. Instead of filling your plate with these high-fat meats, go for lean cuts of beef and pork such as sirloin or pork loin; white meat chicken and turkey; eggs; and seafood. Adding fatty fish twice a week to your menu may help lower cholesterol, too. The omega-3 fats found in salmon, tuna, mackerel and sardines are good for your heart and may help improve your numbers. Like high-fat meats, fats such as butter, cream and lard are also high in saturated fat. When you're trying to lower LDL on your low-carb diet, replace those fats with plant-based ones such as olive oil, sunflower oil, avocados, olives, nuts and seeds. While oils are naturally carb-free, nuts, seeds, avocados and olives aren't, but the amount is small. Ten olives, half an avocado and 19 pecans have 1 gram of carbs each, while 23 almonds have 3 grams of carbs and 1/2 cup of hulled sunflower seeds have 8 grams. You might have a tough time fitting in some of the plant-based proteins if you're on a very-low-carb plan, but if you're up to 60 grams a day, you should be able to add them in. For breakfast, make an omelet stuffed with 1/2 cup of button mushrooms, served with half an avocado, 1/2 cup of sliced red peppers and 1 cup of whole strawberries for 12 grams of carbs. Toss 1 cup of cooked cauliflower, 1 cup of cooked broccoli, 2 tablespoons of red onions, five sliced cherry tomatoes and 1/2 cup of chickpeas with 2 tablespoons of creamy Italian dressing and serve with 19 pecans for a lunch with 23 grams of carbs. 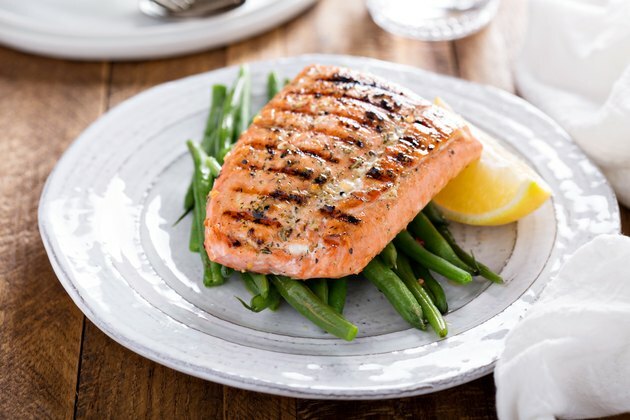 Salmon with 1 cup of green beans tossed with olive oil and 12 slivered almonds makes a heart-healthy low-carb dinner with 5 grams of carbs. What you drink in any good meal plan counts too. Aim for at least 64 ounces of water a day. If you like beverages with flavor, go for herbal tea, unsweetened almond or soy milk or flavored seltzer. Coffee and tea sweetened with artificial sweeteners also work. Creamers are carb-free but high in saturated fat, and fat-free creamers contain carbs. Drink coffee and tea black or add unsweetened soy or almond milk; if you can't do without regular creamer, limit it to 1 tablespoon a day.